Friday, Nov. 11, 4 p.m. About 67,000 more ballots have been counted and the vote totals have been updated today. The percentages are unchanged from the last update on Wednesday morning. 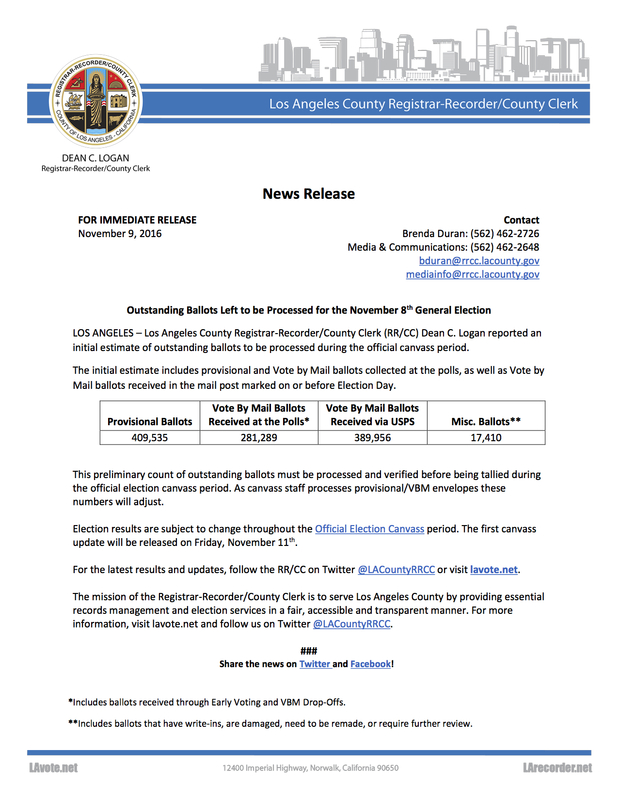 Thursday, 8:20 a.m. Here’s the news release from the County Registrar’s office on the votes that remain to be counted in Tuesday’s election. The overall results are not expected to change but we’ll keep updating as the results are updated over the next few weeks. The same happened in 2012 with Measure J, with the approval percentage climbing as more votes were counted. Added Metro Board Chair John Fasana, who said he listened to President-Elect Trump’s speech on the radio last night after the M party and was hopeful local transit agencies and the federal government could find shared interests. “He talked about fixing our cities and rebuilding our highways and bridges and tunnels and airports and making our infrastructure second to none,” Fasana said, noting those are the things Metro also hopes to do. 10:45 a.m. 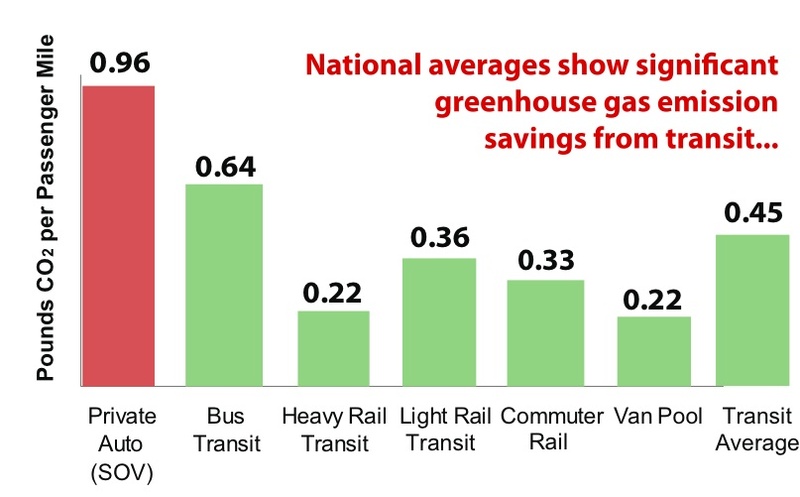 I know that climate change wasn’t a big part of the national conversation in the past 24 hours, but a gentle reminder: generally speaking, taking transit instead of driving alone is a good way to lower your carbon footprint and hopefully slow the pace of global warming. Hopefully M will give more folks more options other than driving. See this post for more info. Working on it — but if someone beats us to the punch, please post the link! We must learn to feel the faintest tinge of nausea at every news story that tells us what we want to hear. 10:25 a.m. We’ve already seen many questions about the project timelines in the document below. Metro has said that it will try to accelerate some projects through public-private partnerships. The agency recently issued two news releases (this and this) about unsolicited proposals received by the agency’s Office of Extraordinary Innovation (OEI). The OEI also penned this recent post about that effort. My three cents: these aren’t easy deals to put together and will obviously get a lot of scrutiny. But given that federal funding for infrastructure has fallen in recent years, P3s have to be fully explored. 10:20 a.m. I know a lot of folks — including yours truly — want to know what happens next. One short answer: assuming M goes on to win, the agency will need to update its long-range plan since there is now funding for many projects that previously were unfunded or under funded. That process will take place in 2017. 10:18 a.m. If you’re new to Measure M or need a refresher, here is a quickie list of project descriptions. 9:56 a.m. If anyone needs them, here are some pics from the Measure M campaign party in DTLA last night. 8:13 a.m. I’ll ask again what I asked readers last night: how did you vote and why? I’m very interested to hear the reasons and any other comments or questions you have now that it appears extremely likely that M will pass. Comment please. 8:12 a.m. Here are statements from Metro Board Chair John Fasana (who is also a city of Duarte Council Member) and Metro CEO Phil Washington. There will also be a press event later today at Union Station. 7:53 a.m. Many of the big ballot measures across the U.S. involving transit and transportation are ahead in the polls. The two largest — Measure M here and Sound Transit 3 in the Seattle area — are winning. A huge bond measure passed in the Bay Area to benefit BART, as did a sales tax to help the MARTA system in Atlanta. Urbanist/Journalist Yonah Freemark has been keeping track in a handy Google doc. 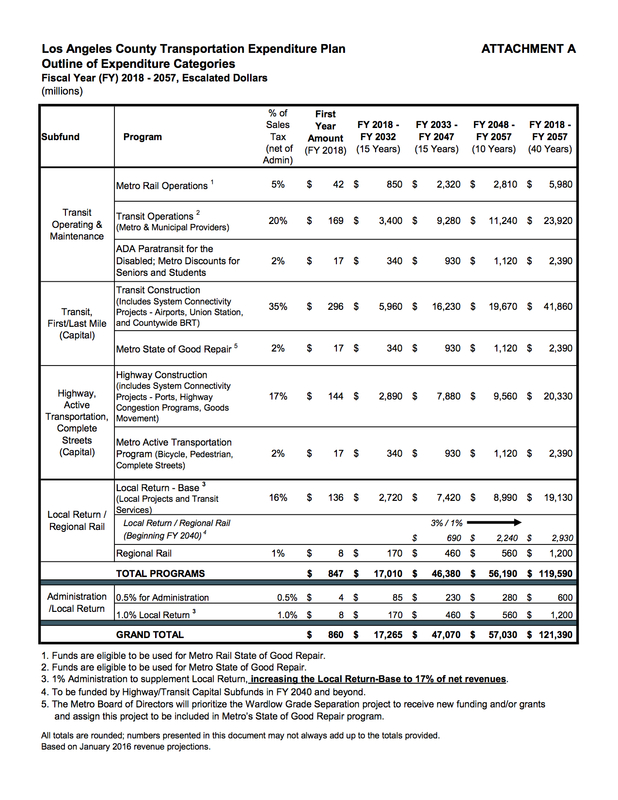 It’s worth noting that road/transit ballot measures in the San Diego and Sacramento area appear to have failed. 7:27 a.m. Good morning! To put this in perspective, Measure R in 2008 won with 67.9 percent of the vote. 2:07 a.m. Well, I can’t sleep. So this is the final update for the evening. M is winning by nearly three percentage points. There are still many ballots to be counted and, as we learned in 2012, likely many provisional ballots. But with just shy of 70 percent of precincts reporting, the math is increasingly in M’s favor to be approved. Measure M is the largest of the transpo ballot measures going to voters this Election Day. The second-largest, in the Greater Seattle area, is also winning thus far. 11:53 p.m. This will be the final update for the evening. A lot more votes to count but M is up by two percentage points. Thanks for reading, folks. Obviously much to discuss tomorrow. 11:46 p.m. A couple pics from the M party in DTLA. L.A. Mayor and Metro Board Vice Chair Eric Garcetti. Photos by Juan Ocampo for Metro. 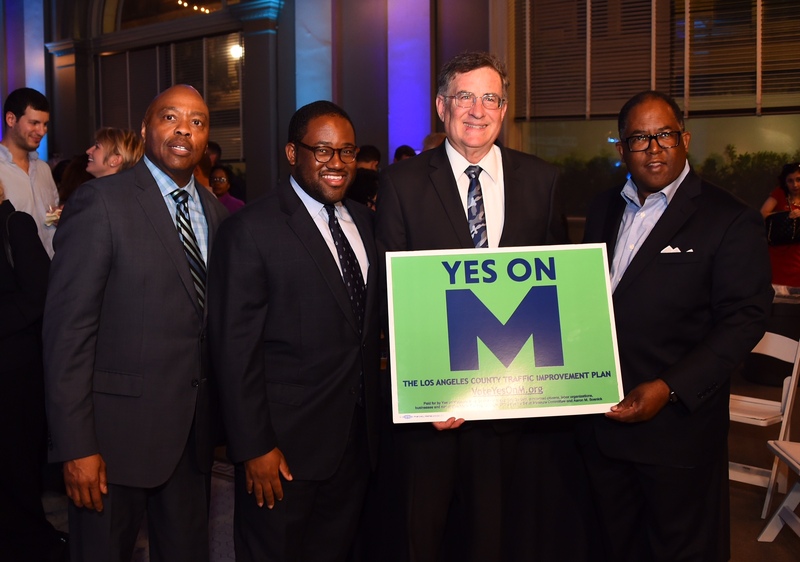 From left, Metro CEO Phil Washington, Assemblyman Sebastian Ridley-Thomas, Metro Board Chair John Fasana and Supervisor and Metro Board Member Mark Ridley-Thomas. 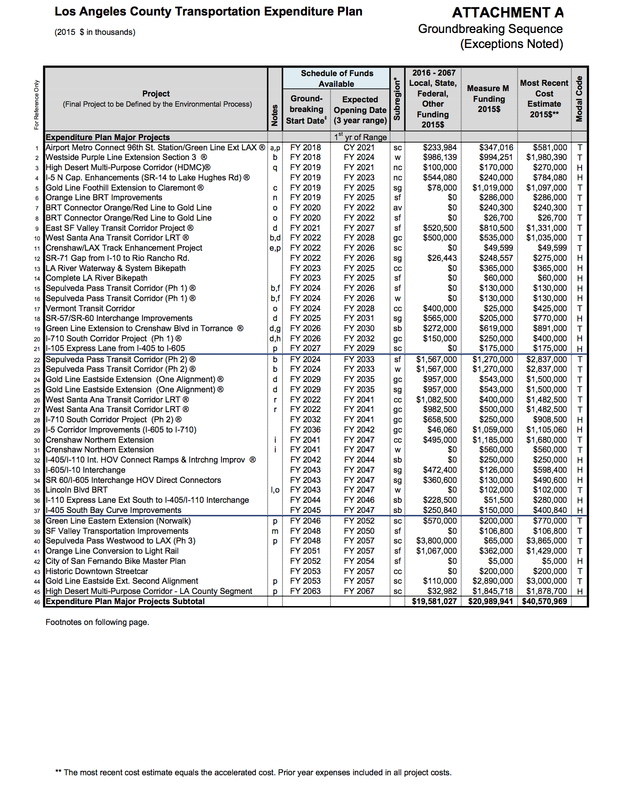 11:00 p.m. Take a gander at Yonah’s spreadsheet — transit ballot measures are doing well. 10:53 p.m. “We’re not declaring victory yet. The trend is a good one,” L.A. Mayor Eric Garcetti just told the crowd at the party. 10:41 p.m.: Another update. Still very early but the percentages are ticking upward. 1o:14 p.m. Just noticed that they’re playing Blondie at the M party. Which tells you something about the average age of the room. Which, btw, is broiling. 10:12 p.m. Slightly new numbers. Finally. 10:04 p.m. Still waiting for another update! But I used the time to make it over to the M party and let’s just say there are some very fine colleagues of mine from the Rocky Mountain region who are learning how we do vote counting out here in Southern California. 9:13 p.m. The first update was more than half of the vote by mail ballots. The rest are presumably coming soonish. 9:09 p.m. I feel like “early” is the key word there. Seventy-one minutes after polls closed, we’ve received exactly one update! Garcetti says strong early returns on Measure M and Prop HHH show that "clearly Angelenos want to address homelessness and traffic." Metro CEO Phil Washington says he's "optimistic" about Measure M's chances, but doesn't want to speculate on how close it could be. 8:59 p.m. As I mentioned earlier, L.A. County isn’t exactly known for its speedy vote counting. Since the last update, I have demolished a lamb slider, two pickles, many chips and other assorted food stuff. What’s your Election Night diet? Do tell! San Diego’s Measure A transit funding appears to have lost… with 57% of the vote, at least so far. Sacramento’s Measure B transit measure appears to have lost… with 65% of the vote in favor. I’m ready to “call” Atlanta’s MARTA referendum. At 66% reporting, it’s leading with more than 71%. Congrats Atlanta! At 89% reporting, Indy transit referendum is at 59%. It will pass. Congrats, Indy! 8:25 p.m. First returns posted…still early! 8:11 p.m. I’m curious why you voted the way you did on Measure M. Please leave a comment — not a treatise but a good solid comment explaining your vote. Thanks! 8 p.m.: The polls are closed in L.A. County. Start hitting the refresh button on the County Registrar site! Not like the presidential race is crazy close. Oh wait. This just in: the presidential race is crazy close! The first Los Angeles County returns (including Measure M, the @metrolosangeles sales tax increase) should come in around 8:30 p.m. PST. 6:20 p.m.: Good evening, everyone! After the polls close at 8 p.m., we’ll be posting returns here for Measure M, Metro’s sales tax ballot measure that if approved by Los Angeles County voters would fund a number of transit, road, pedestrian and bike projects and programs in Los Angeles County. The results will be coming from the L.A. County Registrar’s site once the counting begins. •Measure M is a sales tax increase and, thus, needs two-thirds approval to pass. In Los Angeles County, that means 66.6666 percent of the votes cast for M. Measure M would raise the countywide sales tax by a half-cent and extend the Measure R sales tax beyond its 2039 expiration date. Here is a list of current sales tax rates in cities in L.A. County; it’s currently nine percent in most. •To put it another way, if M passes it would add a half cent (.005) to every dollar you spend that’s taxed. That’s five cents for every $10, 50 cents for every $100 and $5 for every $1,000 you spend on items that are taxed. •The Measure M election is likely to be close. Metro went to L.A. County voters in 2008 seeking a 30-year sales tax increase and in 2012 hoping to extend Measure R for 30 years. The results of both elections were similar enough but R managed to narrowly climb above the two-thirds threshold while J narrowly did not. The number that jumps out at me is the turnout: it was significantly higher in 2008 — when Barack Obama was first elected president — than in 2012, when Obama ran against Mitt Romney. Another interesting number from 2012: 3,179,614 votes were cast in the U.S. presidential election in L.A. County but only 2,863,951 on Measure J. Not everything down ballot is voted upon. I mention that because Measure M was literally on the last page of the very long ballot I cast in Pasadena at midday (no lines, btw). 4,022 voters through early voting at noon; more than 30k cumulatively from early voting + 805,489 mail ballots already voted & returned. Laura Nelson, LA Times transportation reporter. Meghan McCarty, KPCC transportation reporter. StreetsblogLA, the local blog that focuses on transit, pedestrian and biking issues. L.A. Mayor Eric Garcetti (he’s running the M campaign). Yes On M (the official campaign). Yonah Freemark — journalist tracking transit and transpo ballot initiatives across the country. Sound Transit — the agency serving the Seattle metro area has one of the larger ballot measures tonight to fund a large transit expansion. BART — the rail network serving a big slice of the Bay Area has a bond measure to overhaul their system. I wish Measure M is going to pass! I really want to see an expanded and interconnected Metro system here in LA County. Also, Measure M will reduce traffic congestion and improve mobility throughout the county! Go Measure M! Go Metro! I voted yes so I don’t have to drive to APU to get to dtla from Claremont! Since Measure M has likely passed over 2/3 of the vote. I think a list of the top 10 rail projects should be selected to be built in the first decade. Also, another top 10 list for highway/street projects, too. Excellent points William — and thanks, too, for the support! That’s the billion dollar question: what will the feds do. The hope here is that everyone is truly serious about creating jobs and view infrastructure as the way to do it — even if it means supporting transit, which some quarters have been historically hostile to. More questions than answers on that front. I voted YES on M since I believe in the transportation revolution is just beginning in LA County. I live in the Gateway Cities and am most excited about the Western Santa Ana Branch line (Artesia to LA Union Station) and would like to see it be sped up via the P3 public/private partnership similar to what happened with Expo and Gold Line extension..
We have the infrastructure in place (from the streetcars and Pacific Electric railroads) and just needed funding. With our highways at capacity, the solution is to invest in rail, buses, and other alternatives such as bikeshare, transit-oriented development, and rideshare. With the apparent passage of M, we can help build for a better LA and hopefully this shows and persuades the IOC that LA is preparing itself for the 2024 Olympics. If LA does get awarded the 2024 Olympics, perhaps there will be extra incentive to speed up the Measure M projectS? Thanks for your support! I think certainly this will help the Olympic effort — although the other cities bidding are formidable, especially Paris. That said, if L.A. is selected that could certainly help expedite some federal funding under current funding laws. The X factors are Congress and President-elect Trump and what they will do budget-wise in terms of the Federal Transit Administration. There was certainly a lot of support for local transit at the polls last night, but I’m not sure that support lined up with support for Trump and many other members of Congress. So we’ll see. As I understand it, Segment 1 is the outer portion. If so, it should be connected to the Blue Line so that there will a transfer-free ride from DTLA to Artesia, Since the Regional Connector will be operational, it should be possible to run trains every 2 minutes north of the Expo-Blue junction to allow 6-minute rush hour headways on each line. Metro should consider extending this line to the Orange County line or beyond to allow cross-platform connections with the proposed Anaheim Connector (http://anaheimfixedguideway.com/) and the OC Street car )http://santa-ana.org/pwa/ocstreetcar.asp for service to Santa Ana. 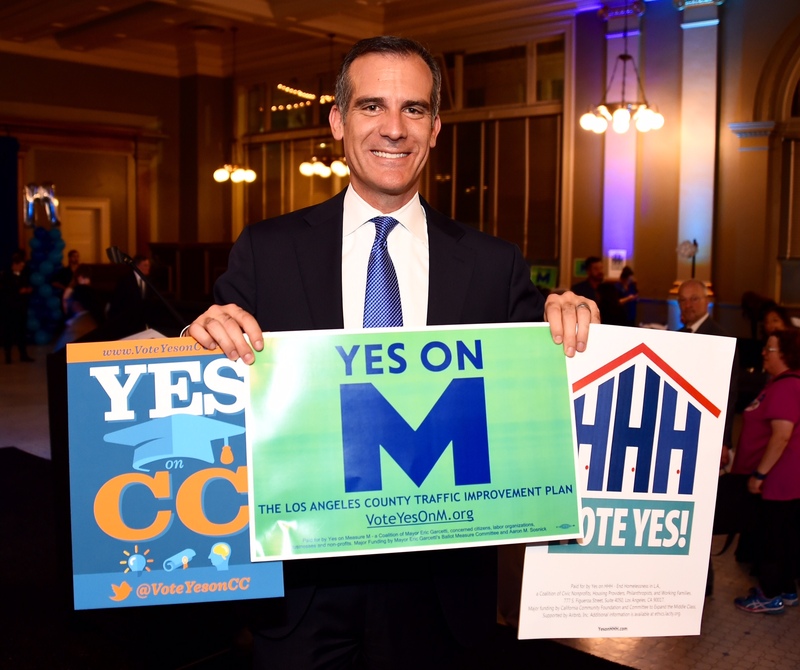 I voted yes on M because even though the prospect of expanding highways in Los Angeles and even potentially constructing brand new ones is frankly absurd, we need a fully functional transit system in LA county. Also, props 13/218 make it unlikely that we’ll get a chance this good again in the near future. Question for you: this Crenshaw/LAX enhancement project doesn’t appear on project maps. Do you know what segments would be put underground? It’s the segment already in a trench next to the LAX south runway. FAA wants it covered at some point, the agency just needed to find the money to do it. Hi Steve. 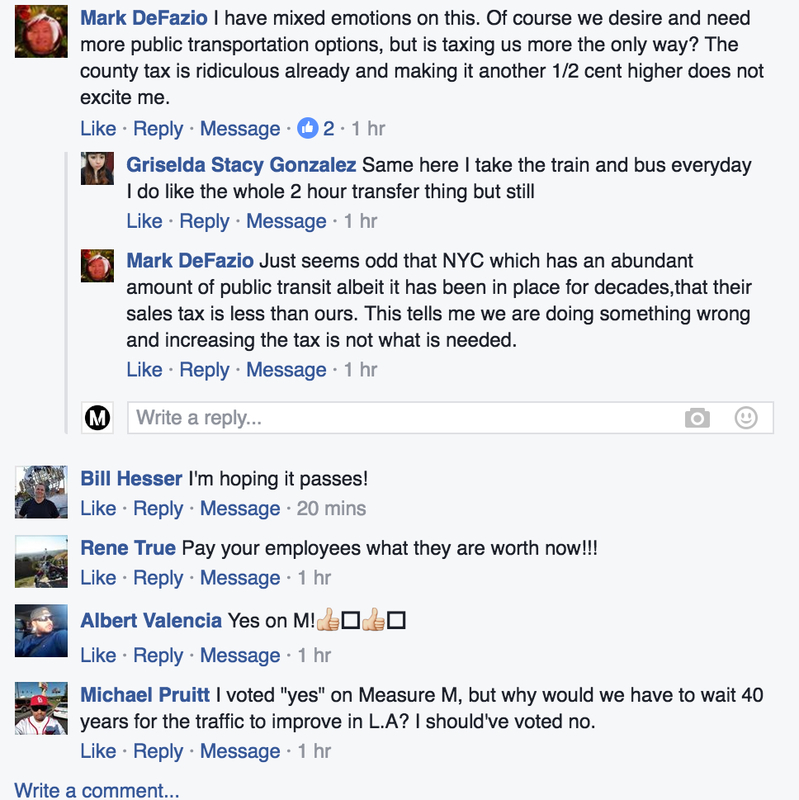 When will Measure M’s 0.5% sales tax increase take effect? 1-1-2017? July 1 of next year assuming M wins. The Measure R extension would begin July 1, 2039. I voted yes on M as I am a long time supporter of public transit in the region. M was not perfect, but I really think it has some good projects and it was about the best we’d get in my lifetime. I hate the highway funding and a few of the projects are more political than useful. Some of this is going to be very tough to implement especially with the PPP component, but I suppose Metro will be busy for quite a while now. I think it is critical we don’t build projects with major weak points in major areas like Expo now. Good luck to Phil Washington and the Metro team in executing. They are going to really need it. I think you raise an excellent point. And this is why it’s crucial for everyone to pay attention to these projects as they are planned. That ship has sailed and also caught fire. Completely agree. Paris will still be tough — as 2024 is the 100th anniversary of last Summer Games in Paris, but this certainly shows that the city is serious about upgrading its transportation infrastructure and has the local funding to do it. Metro, you went for the “brass ring” and were successful, congratulations. Please prove worthy of the significant trust, and the resulting significant resources, that voters have granted to you. On behalf of everyone, thank you. And you’re comment about “significant trust” couldn’t be more on point. I voted yes on M because I believe in a bright future for urban Southern California and Los Angeles, a future that in my experience will prove best spent outside of the car, on two feet or two wheels. The lack of mobility options here is a huge drag on our economy, our daily lives, our society, and not least our incredible natural environment – M is one small step in the right direction. Metro, now it’s your turn to stand up to the challenge and carry this region forward for the better. Yay! Congratulations to all of us! Los Angeles County is the real winner. Yes on M! Please prioritize the purple line extension. Any insight as to when we will get more info regarding the public-private partnerships? 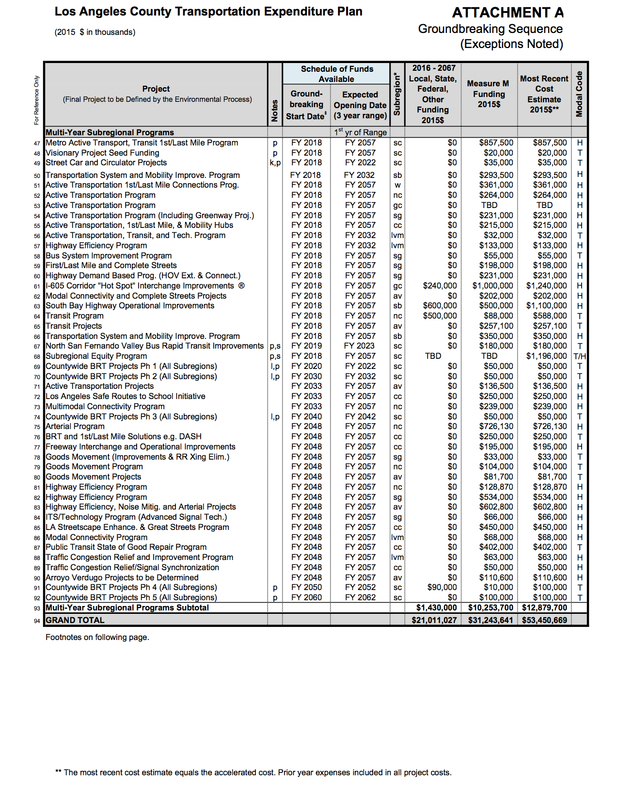 Can Metro issue Revenue Bonds using Measures R and M receipts as collateral? Now that it appears that Proposition 53 was defeated, it may be possible to do so without a vote. Would such a measure actually reduce costs by eliminating the inevitable price rise with inflation? Does the CA legislature need to pass enabling legislation? This should be possible now that the Democrats apparently will have super-majorities in both the Assembly and Senate. I know if Hillary would had won the presidency she will sign off on Federal money for these projects now that Trump has won My worry is Trump will not sign off money on the must needed transit projects for LA. Will the presidency have an effect measure M projects? The only light we can see from a Trump presidency is that he’s not a rural Republican. As a New Yorker, he may be much more friendly towards urban infrastructure than say, a Mike Pence would be. If (and boy do I mean if) he is as enthusiastic about infrastructure spending as he says he is, cities might benefit. I voted for Measure M primarily because of the improvements and benefits to the San Gabriel Valley. Not to throw cold water on this parade but many structural issues remain that still make transit ineffective. Extra money will let Metro and its municipal transit agencies paper over issues like pension costs and work rule inefficiencies. The labor unions gave significant money to see Measure M pass and they will likely use added revenue in bargaining for more wages and not contract out service, even when Metro shouldn’t be operating it. Operating cost growth needs to be contained. Our transit fares, already the lowest out of our peers, are going to stay low, when they need to be higher. Measure M did not address issues in local return, where Proposition A money is often spent by cities on low ridership shuttles or recreational transit because they don’t have anything better to spend it on, while Measure M did not require funds to go for bike or pedestrian improvements. Therefore there will be a gap between what individual cities choose to spend their money on. Metro needs to make sure that Measure M operating funds go to new service and not for excessive staff or cost increases. There are bike ways and trails in the list of Measure M proposed project, such as along the Los Angele River, See the list of projects in another recent Source blog. Under Measure M, I’m really excited about the North Hollywood-Pasadena BRT, which will serve the cities of Burbank and Glendale. Finally, a Metro bus rapid transit line running through my neighborhood! Only a few more years to go! How quickly will the jackhammers start breaking up the pavement on Van Nuys Boulevard? Hopefully soon. I want to be able to ride the rails on the East SFV Transit Corridor route before I’m a frail old lady. Then again, we are planting trees that we 50 somethings won’t be able to sit under to enjoy their shade, and that makes us better than some parts of this country. Measure M is about the long game, and improving Los Angeles for future generations. It’s about sustainability in the face of historic climate disruption. Congrats to all: WE WON THIS. Oh yeah, Panorama City Neighborhood Council has gone on record as supporting the ESFV Transit Corridor rail yard in Panorama City, in our industrial district which is very hollowed out at this point and the location of homeless encampments and squats. Our community needs the jobs. Please consider it. Thanks. Van Nuys Blvd (The “East SF Valley Transit Corridor Project”) is scheduled to break ground in 2021 as of right now.